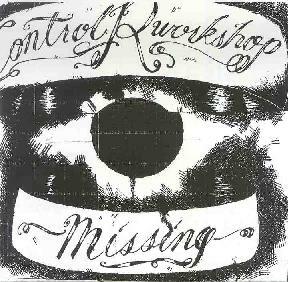 Control R Workshop - "Missing"
Control R. Workshop is a three piece free style music trio of percussion, sax, guitars and sounds from the San Francisco Bay area (Emeryville). This CD-R (originally released on vinyl) is a live performance broadcast on KDVS on 6/28/01. There are no names on the four tracks (improvisations). The first track begins with a long like drone of a violin bow on metal and various strange sounds and sax sounds and percussions, which slowly build the piece up over the 14 minutes. The sound is raw and quite disturbing at times. The second piece begins with sax and the guitar plays in or against the efforts of Randy. Quite a strange interplay, before the drums come crashing in. The third track starts much like the first track but is built upon a drum roll with sax being layered in and strings bent over the top. The final track is the most like free jazz with excellent drumming. Quite a strange release but a very raw energy between the musicans is captured in this performance. If you like free jazz, check this out. For more information you can email Control R Workshop at: daron_k@yahoo.com. Contact via snail mail c/o Daron Key; 4369 Adeline St #7; Emeryville, CA 94608.